These instructions tell you how to start using an expired access right again. Restoration is possible for a maximum of one year after the expiration of the access right. Access rights are restored using the same tool as for the activation of them. Follow these instructions until step 11. Administering your own access rights. The following steps are different from the activation of a new user account and should only be used for the restoration of an old user account. 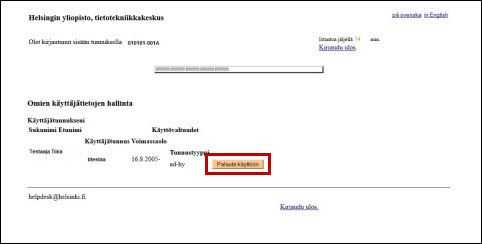 Click Palauta käyttöön (Restore to use). (1) shows the user account to be restored. 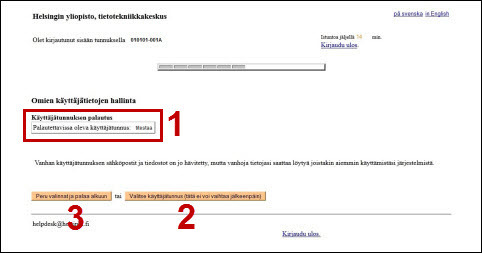 Click Valitse käyttäjätunnus (2) (Choose a user account). Note that you cannot change this selection later. To cancel the changes and return to the beginning, click Peru valinnat ja palaa alkuun (3) (Cancel selections and return to start). 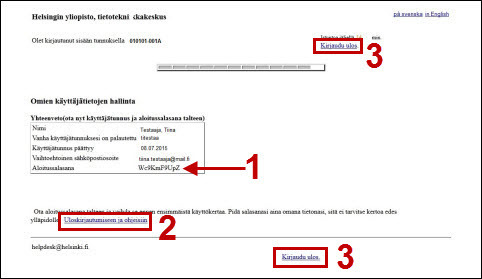 Click Jatka päivämäärään pp.kk.vvvv (Continue to date dd.mm.yyyy). The access rights are always valid for a fixed period of time depending on a work or study relationship with the university. (1) shows your university e-mail address. You can enter an external address in section (2). Click Hyväksy (3) (Accept). If you want to cancel the choices and return to the beginning, click (4). You see a summary of the previous steps (1). 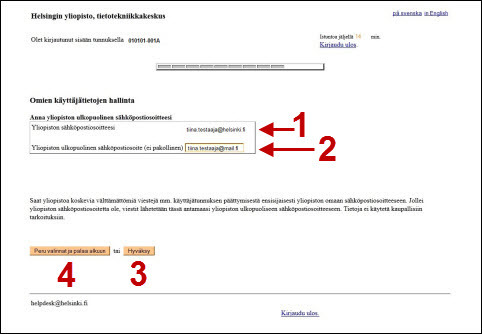 If the information contains errors, click Peru valinnat ja palaa alkuun (3) (Cancel selections and return to start). 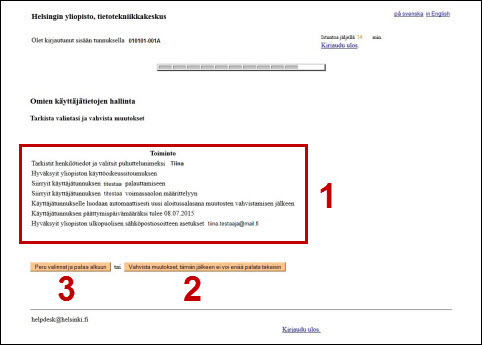 If the information is correct, click Vahvista muutokset (2) (Confirm changes). The information cannot be changed after confirming. (1) shows the temporary password. To log out, click (2) or (3). You will receive more information after logging out.